When thinking about what makes the new Davies Tasting Room special, the word placemaking immediately comes to mind. 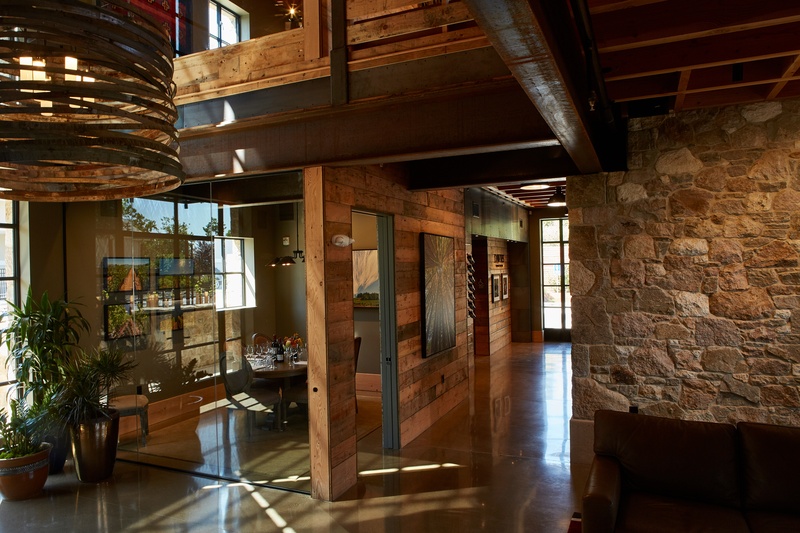 The structure and space was envisioned to capture the heart of the Wine Country community. Before discussing how this present day space went from a vision into reality, it is important first explore the winery’s past. Davies Vineyards was conceived at the historic Schramsberg Winery, which is situated in the Diamond Mountain appellation south of Calistoga. Named after Jack and Jamie Davies, the founders restored Schramsberg, one of the earliest wineries in Napa Valley. For reference, Schramsberg was founded in 1862, a time when our country was still involved in the Civil War. Today, Jack and Jamie’s son Hugh is the President of Schramsberg. Additionally, he oversees wine making for Davies Vineyards. 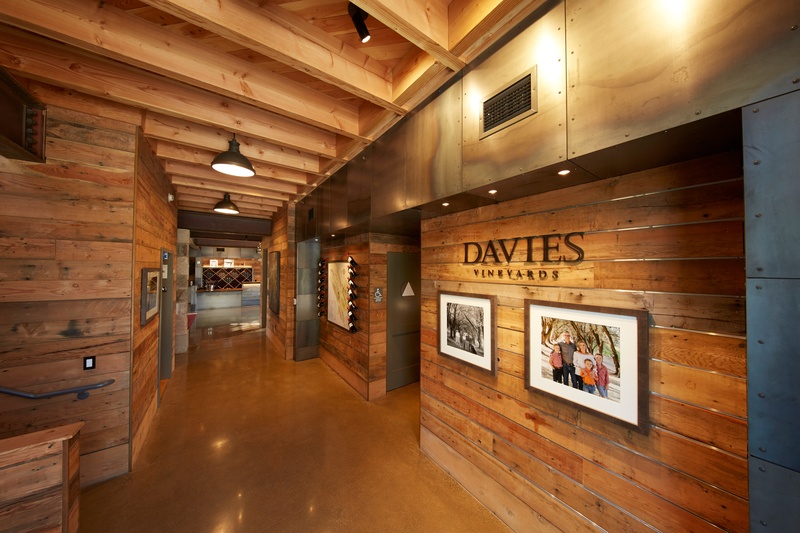 In 2012, Davies Winery found a home in a southern area of St. Helena just off of the congested Highway 29. Visitors will know they are close if they see St. Helena High School, which is just next-door. Location is everything. Davies Vineyards is exposed to the many people traveling in out of the Valley. While many people know that public exposure can be great for business, the owners recognize that there needs to be a level of sensitivity towards the community. It is important to strengthen the connection between people and the places they share. Imagining the Davies Vineyards tasting room required a collaborative process to design and build a public space to maximize shared value. 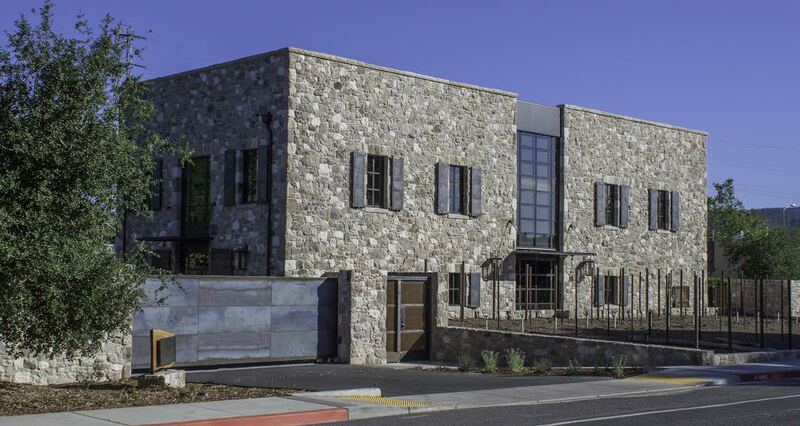 Designed by Osborn Siegert Architecture, the two-story structure resembles the old stone buildings of St. Helena. 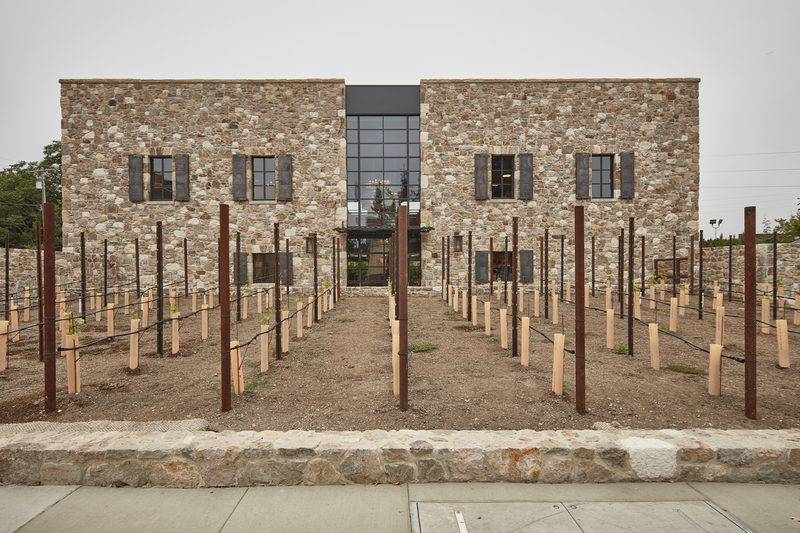 Clad in stone quarried from Napa Valley Mountains, the tasting room is intended to look like it’s somewhat old resembling a ghost winery from the pre-prohibition era. 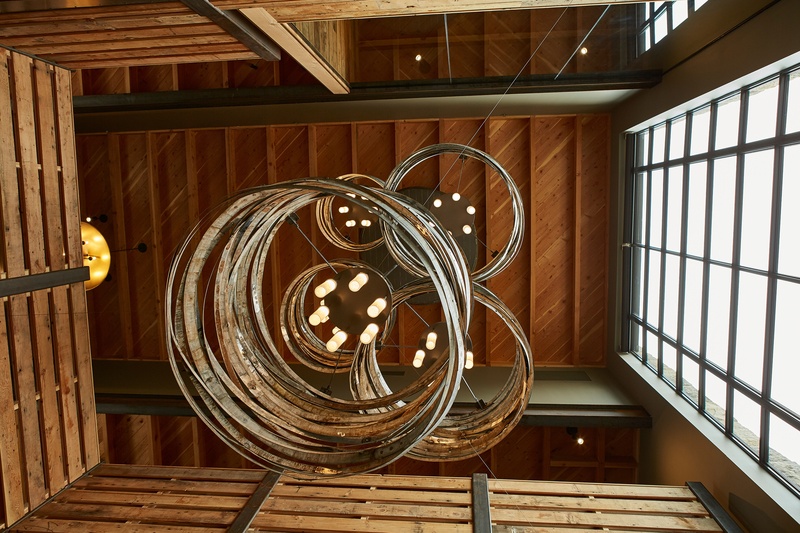 Blended with concrete, iron, and repurposed barnwood, the elements come together to give a sense of history. Along with a nod to the City, the structure represents the winery’s first ever stand-alone tasting room on the same property as their winery. It is also a nice addition and extension of their first home at Schramsberg in Calistoga. 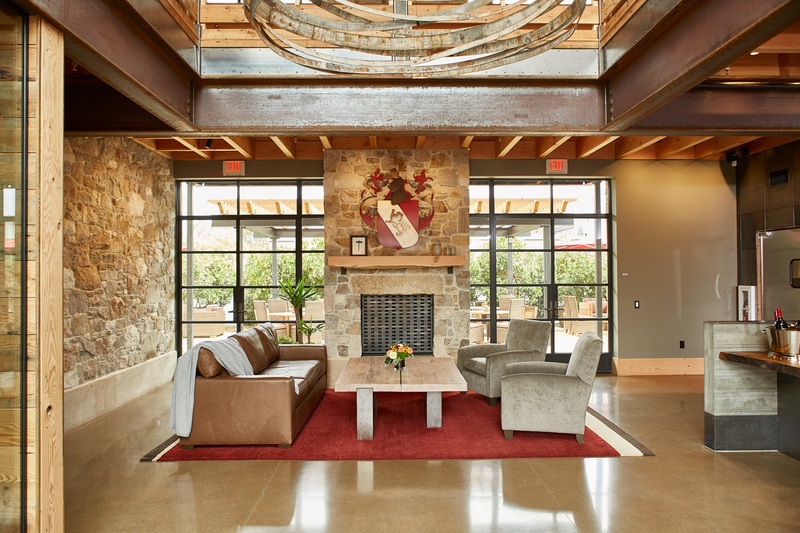 A light-filled reception room highlighted by chandeliers made of metal from wine-barrel straps welcomes each visitor. The space has a refined, collected look, with family memorabilia and artifacts decorating the space like this family crest above the fireplace. A commercial-grade kitchen is on first floor. Equipped with a dumbwaiter, food and wine can effectively be elevated from the kitchen to the second floor. 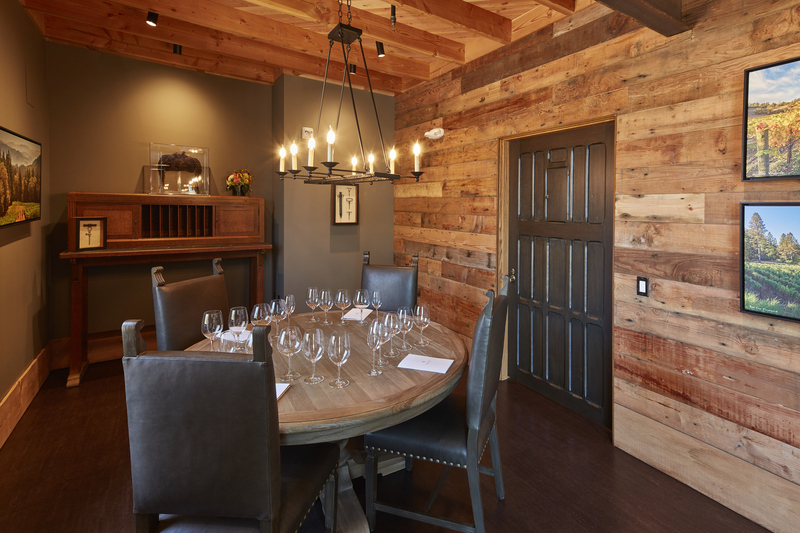 There are several private tasting rooms, one downstairs, named the Pinot Noir room and one upstairs, named the Cabernet Sauvignon room. 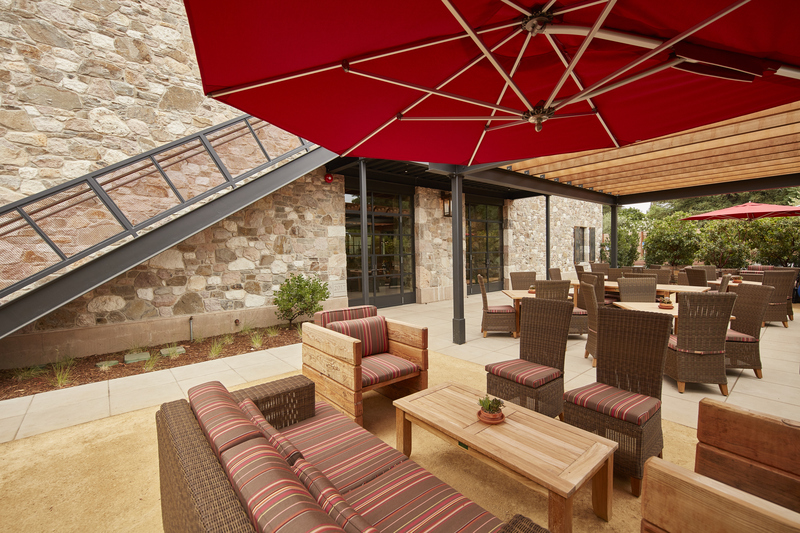 When weather permits, an outdoor patio is furnished with a number of tables for tastings. 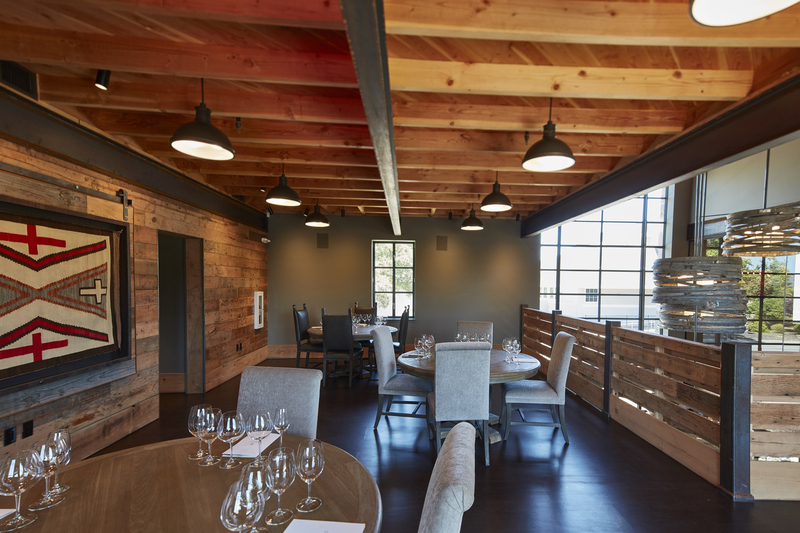 Davies tasting room space recognizes to the physical, cultural, and social identities that define the Napa Valley and support its ongoing evolution. Along with a new tasting room, a demonstration mini-vineyard was planted with various Bordeaux varietals to educate visitors about a variety of practices relating to vines including trellising, pruning and picking. Visitors get an up-close understanding of the changes that occur in vines over a full year including bud break, flowering, veraison and visitors can taste ripe grapes before harvest. Each project presents a new and exciting experience for Centric General Contractors. The Davies tasting room is a well-thought project aimed to serve our community in a positive way. When teams come together to design and build projects that make for a better community, we all benefit.